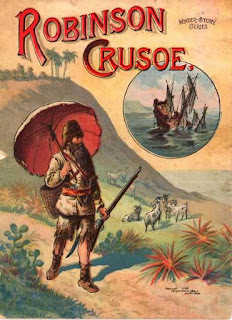 The Robinson Crusoe economy is widely used as a teaching aid in economics to explain concepts such as comparative advantage and equilibrium in an exchange economy. In my view, the use of the Crusoe economy as a teaching aide often trains students to focus only on a few very narrow ideas, and ignore many of the fundamentally important elements involved in economic production and coordination in Crusoe's world. This will be obvious to you when you watch the latest “stranded on an island” reality television show. The lessons of economics simply don’t correspond to the type of production and coordination I see in them. In this post I want to show how Crusoe’s story can be an effective teaching aide, and demonstrate a structured, yet pluralist, approach to economic inquiry, in the way I have previously proposed. 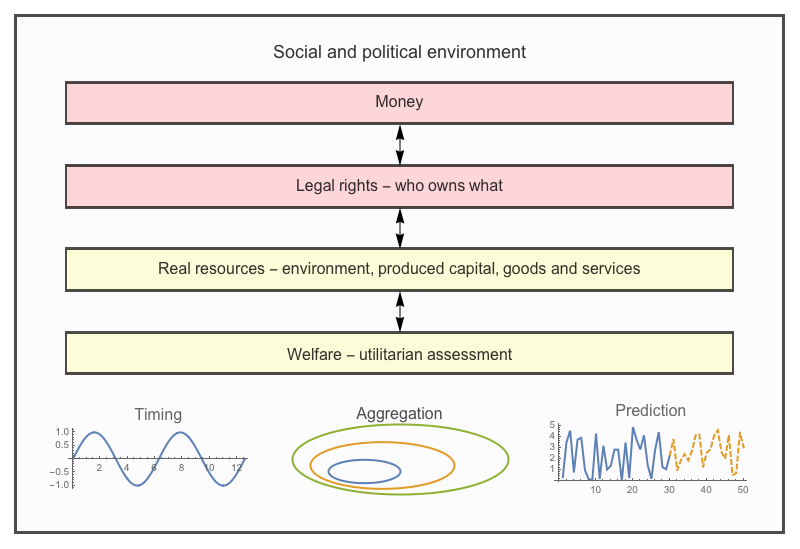 This structure breaks down an economic problem into various domains of interest, along with a number of guiding questions about aggregation timing, and prediction, in order to assess the types of concepts, models and analysis being applied in each domain. Rather than use Crusoe's story to justify a concept - “This is specialisation, remember it by the story of Crusoe”, the reverse approach could be taken. “Here is the story of Crusoe, how would we understand that economics of the story?” Having a structured method of economic inquiry then allows students to ‘discover’ the economic concepts you really want to teach them. Where would such a method of inquiry lead us in Crusoe’s story? First, here is the standard use of Crusoe, which typically focuses on specialisation when Crusoe is joined by Friday. For some reason he has an absolute advantage in producing fish and coconuts, as each day he can produce more both than his companion Friday. But his relative advantage is in coconuts. The graph such as the one below is then used to demonstrate the gains to specialisation. The dashed light blue line is their combined output without specialisation, and the green line is with each producing the product in which they have a relative advantage, and the gap between these lines near the kink of the green line is the gain from specialisation. This lesson is simple, and true enough on its face. But it is very incomplete. So what about my alternative use of the Crusoe economy for teaching economics? We first inquire about how Crusoe and Friday came to understand what their social arrangements should look like, noting that any subsequent economic activity will be embedded within these social relationships. In the actual story Crusoe rescues Friday and ‘employs’ him as a servant, teaches him Christianity, and generally creates a hierarchal social relationship. Under this condition the idea that Crusoe and Friday will equally and jointly make decisions about their production activities and trade is a little strange. What will happen is that Crusoe will use the social arrangement to dictate their joint activities in order to fulfil his wishes, which are themselves a product of his previous social environment. What other social structures could there be in a two-person economy? One case might be that the two are parent and child. In this case the parent will likely have power to dictate the activities of the child, but will also have an incentive to invest in the relationship in order for the child to reciprocate in the future. 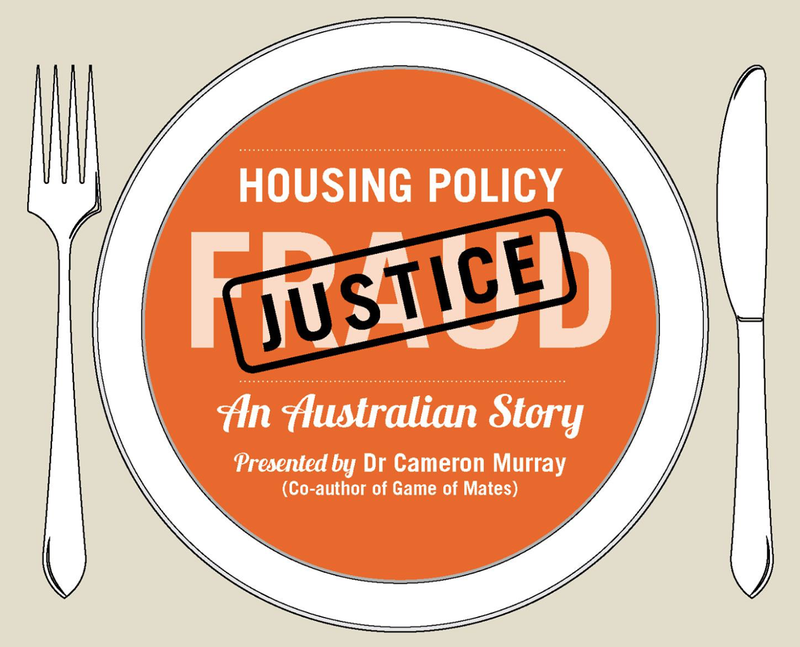 The story can be used to open lines of enquiry about social and political structures and their analysis, revisiting this simple case to enforce the basic concepts later introduced. Moving on from social and political environment, we can then interrogate the related economic domains of money and property rights. We can ask questions about who owns what, and how accounts will be kept. Unless we understand the rights of our two gents, we aren’t going to make much progress in understanding the situation. For example, if Crusoe is a more productive fisherman because he excludes Friday from the most fertile fishing areas by claiming property rights over these areas, this opens up a new puzzle. Would the productivity of Crusoe and Friday be different if they had a different system of property rights? Maybe if Friday could access those parts of the island Crusoe set aside for himself, total output could be much higher. 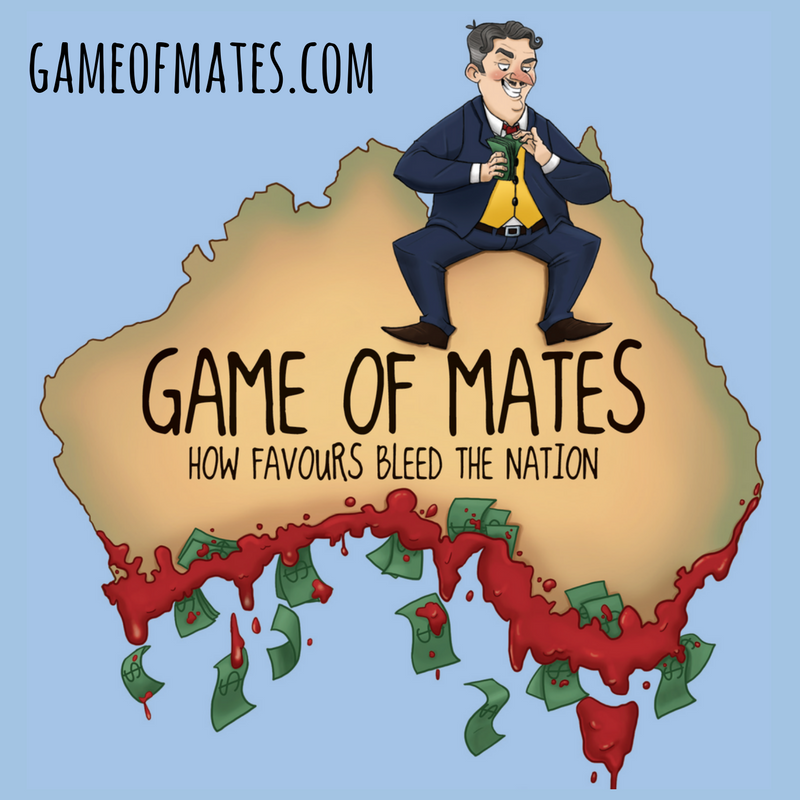 Hence this story can be used to show how understanding the distribution of property rights can help answer questions about whether there are more efficient alternative allocative institutions. For example, maybe cooperative production by fishing together one day, and then collecting coconuts together the next, is even better than any outcome from specialisation. In the money domain we can ask how Crusoe and Friday plan to keep accounts if they specialise, as per the standard economic account, yet some days the fishing is better than others, and some seasons the coconut palms are not fruiting so prolifically. If their daily output of fish and coconuts fluctuates, we create an inter-temporal problem of smoothing production and consumption via accounting. What would these accounts look like? Would Crusoe credit Friday some fish when coconuts are slim pickings, and vice versa? At what price could a debt in fish be repaid with coconuts. These questions about how accounts are kept and how they evolve through time really matter for how Crusoe and Friday coordinate their production. We can use the story as a stepping stone to another story, of the Capitol Hill babysitting coop, and its monetary system, before leaping off to study large-scale monetary systems and central banking. In the domain of real resources we can ask questions about whether Crusoe has always been more productive, and look at how he came to be; a question of timing. Perhaps he has a fishing net that Friday cannot access. If this is that case were again need to ask the question of why it is Crusoe’s net in the first place it it washed up on the beach. Putting this to the side, if Crusoe did specialise in coconuts while possessing a fishing net, there will be a loss in potential joint production because of the idle capital of the net. We know that the existence of fixed capital can break down the logic specialisation, undermining the clear-cut beneficial outcome that is presented in textbook economics. And even if Crusoe is somehow innately better skilled at the two activities, it merely begs the question of how he learnt to be better and what is stopping Friday from learning the skills and even surpassing Crusoe’s productivity. These lines of inquiry can lead into the study of trade, and arguments about managerial economics and learning, infant industries, trade protection, and so forth. We can even build on the standard specialisation story. In the earlier graph I have also plotted a dotted orange line showing a 50:50 split of the output from Crusoe and Friday specialising. Notice that this line sits fully below Crusoe’s own production frontier. What this means is that while there is a gain from trade, it is not clear how it should be split. Obviously, given the existing legal situation and capital stock, Crusoe is more productive and will be able to extract a greater than half share of the resulting larger combined economic pie. But how much? If we deal just with the kink in the combined production frontier for a moment, if Friday receives a 37.5% share of combined output he is just as well off as going it alone and not trading. At that same kink point, Crusoe is just as well off if he receives 53.9% of the combined production of fish and coconuts. Here we have a problem. This trade produces a surplus that needs to be shared. Somewhere between 37.5 and 46.1% of combined output to Friday and the rest to Crusoe will make them both better off in pure output terms. How this surplus gets divided is a defining issue of economic distribution and welfare which is fundamentally ignored by most economists. It is a question of who gets the rights to surpluses generated by trade. If Crusoe captures all the surplus, inequality on the island will start increasing, but if Friday can capture most of it, their wealth will become more equal. 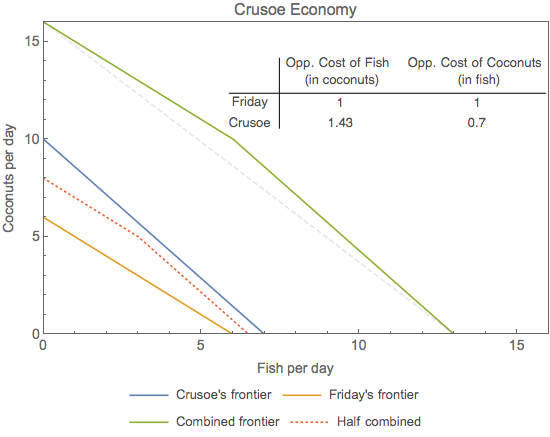 Because Crusoe and Friday now face the problem of how to allocate their economic surplus, the story allows us to introduce ideas of utilitarianism, including how welfare can be assessed or improved. We should be asking why that it, and looking at what else may be happening. Indeed, we can take the next step after discussing specialisation to ask how the scale and diversity of Crusoe and Friday’s economic output can be increased once they have learnt to optimally collect coconuts and go fishing. We then talk about capital investment, innovation, and so forth. The story of Crusoe is usually seen as a memorable simplification for teaching a couple of basic economic concepts. But I argue that it can instead be used to teach a structured and coherent pluralist approach to economic inquiry. In doing so, this approach makes clear the many hidden assumptions necessary to concentrate on the economic analysis of specific domains of the Crusoe economy, and ensure students understand from the very beginning that this is the norm in economic analysis, and to remain critical. "The lessons of economics simply don’t correspond type of production and coordination I see in them. " Are there a couple of words missing in this sentence? I find it interesting that you actually ignored what I saw as the immediate issue - you can only eat so much, so it makes no sense for two individuals to increase their food production so much. The real issue is what they do next now they need less time to feed themselves. Good point. And so obvious I probably should have made it earlier. I allude to it only at the end- "we can take the next step after discussing specialisation to ask how the scale and diversity of Crusoe and Friday’s economic output can be increased once they have learnt to optimally collect coconuts and go fishing"
... Which is the utilitarian issue. Crusoe and Friday don't need money in order to barter their produce. Their promissory notes are not real money and have a limited time before being honored. So the amount that this kind of lesson helps new students is very limited. For the Big Picture (which is actually not so complicated as first appears) we need to consider all of the different KINDS of ways that in our social system, goods and services etc are exchanged. Only 19 different ways apply and these can be distributed into mutual exchanges between pairs of 6 kinds of entities or role-players. Now look up DiagFuncMacroSyst.pdf and see how this is modeled. Time to revisit how we calculate expectations?